Undeniably, yoga is one of the best exercises out there, one that, even though may have had its origin as early as third century BC, can still offer solutions for our modern world troubles. The mental, physical, and emotional benefits are immense; it can prevent disease, as well as help you recover from it. Furthermore, yoga can be practiced year round, and needs ‘zero’ equipment. We tend to equate muscle strength with rigorous strength training exercises at the gym. Sure, they do make you look ripped, but yoga can be just as effective for building muscle strength, improving metabolism, and increasing fat loss as any other strength training exercise. It even negates the back ache and arthritis that comes from leading a largely sedentary lifestyle. Yoga enables your joints to go through their full range of motion which can help prevent degenerative arthritis and reduce symptoms of osteoarthritis. It also works the cartilage well enough for it to squeeze out and receive fluid and nutrients. Poses that employ backbends, forward bends, and twists help keep the spinal disks healthy and supple. They are the shock absorbers of the vertebral column that sadly, due to lack of movement, can be herniated, which causes nerve compression. Yoga improves aerobic conditioning. Even if the poses you practice may not figure as aerobic exercise, per se, they can still increase your heart rate and cardiovascular conditioning. Yoga also lowers resting heart rate, increases endurance, and oxygen uptake. We all need to eat to thrive. But eating is more than just a physical experience. For most of us, eating comes from a far more emotional place. We eat when we are sad, we turn to food when feel happy. Yoga can help with both. The poses of course help you burn calories, and because it is such a holistic practice, it helps you dig deeper into your conscience and become aware of your eating habits at a deeper level. Yoga can improve your relationship with food. Anyone who knows about yoga knows that the first thing it needs is concentration. Concentration comes with focus. It may be hard to cultivate initially, but definitely improves with time. With regular practice you can improve coordination, reaction time, memory, and even your IQ. If you can’t fall asleep, or tend to wake up tired and groggy, yoga can help. Poses like savasana, pranayama, and meditation relax the nervous system and lower stress. Yoga focuses largely on breath control, which can help calm the nervous system and release tension from the body, which again contribute to a good night’s rest. Your immunity is a lot better when your body is relaxed and your mind is calm. Anxiety and stress lower immunity, and invite a series of health of issues- common cold and beyond. Yoga acts in simple ways. It lowers anxiety and stress and helps the body unwind at the end of a long day, thereby indirectly improving immunity. Stress is the root cause of almost every health ailment out there. Delve deeper into your medical issues and stress is sure to pop up as a reason somewhere. Stress is to blame for so many health issues, be it migraines or insomnia or lupus, MS, or eczema, and even high blood pressure and heart attacks. 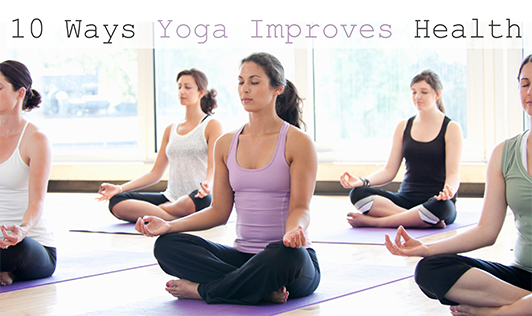 Yoga allows you to capitalize on your movements (asanas and pranayamas) as a means to live longer and healthier. Gentle poses in yoga help restore flexibility, regain strength and decrease muscle tension, thereby also decreasing pain. Several studies have proved that asanas and meditation helped reduce pain, especially in people with arthritis, back pain, fibromyalgia, carpal tunnel syndrome, and other chronic conditions.